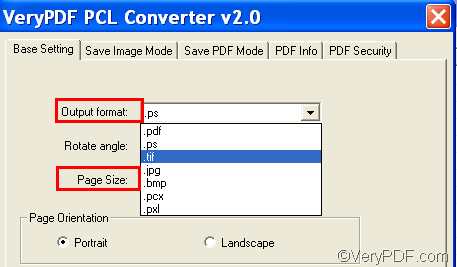 ← How to convert PRN to PS and fit to paper size? I have tried a lot of document converters to convert PRN to TIF and fit to paper size before. I think VeryPDF PCL Converter is the quickest one that can help me accurately solve the problem. In this article, I would like to share some tips with you and explain how to take four steps to convert PRN to TIF and fit to paper size. Firstly, you need to open VeryPDF PCL Converterby double clicking its icon on the desktop. If you haven’t got VeryPDF PCL Converter yet, you can click here to follow the link and download it. The illustration is the interface of the full version of VeryPDF PCL Converter. Compared with the full version, the trial version has one more button: the Register button on the right side of the button bar under the list box. Secondly, after you open the application, you should input the PRN files you want to convert. Please drag the PRN files from Windows Explorer, and then drop them to the list box on the interface. Then, all the selected PRN files will be displayed on the interface. You can view the file names, sizes, paths, types, and other information it in the interface. Thirdly, please set options like the output format and the page size. Just do as follows: click Setting on the interface. In the dialog box that pops out, you can specify .tif as the output format in the Output format combo box; and choose a proper size like a3 or b5 as the paper size in the Page Size dialog box. Of course, if you like, you can set other options like page orientation. After setting options, please click OK. The last step is simple: click Start on the interface, select a folder from the dialog box that appears, and then click OK to start the process. You can view the progress status on the interface. The progress bar can show you the conversion information. When the bar is 100% full, you can go to check the result files. This is the method that you can use to convert PRN to TIF and fit to paper size. Would you like to own VeryPDF PCL Converter? If so, please click Register on the interface. This entry was posted in VeryPDF Blog and tagged fit to paper size, prn to tif. Bookmark the permalink.